I'm always a little hesitant to cook chicken in the crock pot. If you're not very careful, it drys out and becomes chalky and completely unappetizing. So I was a little worried when I came across this recipe for Corsican Chicken with Sun-Dried Tomatoes in Michele Scicolone's book, The French Slow Cooker. However, the roasted peppers with sun-dried tomatoes drew me in. With two of my favourite flavors, how could it be bad? I was having guests Saturday evening, so I took my time on this recipe. This is how I love to cook - slowly, leisurely throughout the day, until at last the meal is ready. Does this defeat the purpose of the crock pot? Maybe. But if I could, I'd cook like this everyday. The original recipe calls for four pounds of chicken pieces and half a cup of chicken stock. So I started with a whole, pastured chicken weighing nearly four pounds. Early in the morning I cut the chicken into eight pieces, and set the carcass in a stock pot of cold water with a splash of vinegar to soak for 30 minutes, before I started the stock which I would use later. The stock simmered slowly for three hours, filling to house with ethereal, healing steam, before it was time to start the chicken. In the meantime, I roasted my bell peppers. One orange, one red - using the same method I do when making my Roasted Red Pepper Soup. Oh, how delightful the house smelled when I was done! When it was time to collect all the ingredients in the slow cooker, I simple dipped out some of the stock from the simmering pot, letting the rest simmer well into the night. Beware. Preparing this Corsican Chicken my way takes all day. So, if you're like me, and enjoy working on a project gradually and unhurried throughout the day - a little bit here, a little there - this recipe's for you. If not, you can always use a cut-up chicken, boxed stock, and jarred roasted red peppers. Either way, with a good bottle of Pinot Noir, this meal is sure to please. Cut the chicken into eight pieces, remove the skin, and refrigerate. Meanwhile, place the chicken carcass in a large stock pot with a splash of apple cider vinegar and cold water to cover. Allow carcass to soak for 15 -20 minutes before bringing to pot to a boil. Add salt, pepper, and aromatics of your choice (carrots, onion, garlic, celery, bay). Simmer, partially covered all day (8 - 10 hours). Line the bottom oven rack with foil and place the top rack 6 inches from the broiler. Preheat your broiler on high. Place the clean peppers directly on the top oven rack and broil, turning occasionally until the peppers are charred and nearly black all the way around. Place the peppers in a bowl and seal tightly (with lid or plastic wrap). Let set until the peppers are cool enough to handle. Cut the peppers in half and remove the seeds and ribs, the peel off all the charred skin. Cut the peppers into strips and set aside. Season the chicken well with salt and pepper and place in an oiled slow cooker. Top with the garlic, bell peppers, tomatoes, rosemary, and stock. Cover and cook on low 5 - 6 hours, until the chicken is cooked through. Remove the chicken, tomatoes, and peppers with a slotted spoon to a warmed platter and cover with foil. Mix the cornstarch with the water and whisk into the remaining sauce. Turn the slow cooker to high and cook 20 - 25 minutes, until thicken. Pour the sauce over the chicken and garnish with the basil. Serve with a good loaf of chewy, whole-grain bread. Oh, fantastic. Corsican Chicken is my go to dinner this summer. I will definitely give this recipe a try. Thanks, Rebecca. Your welcome! I hope you enjoy it! Yummy! Stopping by from Freedom Friday hop and following. Thanks for sharing this AMAZING recipe with Weekend Potluck! This sounds/looks lovely! I'm always looking for new tasty ways to prepare a whole chicken. Thanks for sharing it at AFW this week! Debra, Tonya, and Michelle - Thank you all for stopping by! That is a lovely recipe. Too bad my husband doesn't like sun dried tomatoes. I love them. Yesterday I made a hawaiian pulled chicken in slow cooker and it was delicious. It has chicken breasts, honey bbq sauce, a little bit of brown sugar, drained chunks of pineapple, sliced onion and red bell pepper. It was delicious!!! Your chicken sounds delicious! Hopefully your husband will come around and you can try this one. It really is a great combo! Your delicious chicken is my personal pick today, on Weekend Potluck! I am also sharing this to my facebook page. Thanks so much for the feature! I'm honoured that you chose it! Thanks, Alea. I hope you like it! Wow, that sounds delicious! 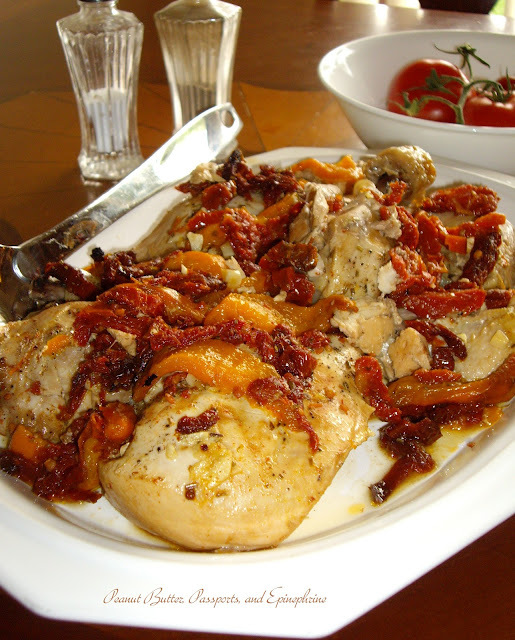 I love sundried tomatoes with chicken- i'll have to try this recipe. Thanks for the invite, Carole! I just linked up.